Air and you think I wonder how much this is going for at the AH, you can mouse over it and it will tell you the last checked price per item. It is best to run a scan every 3-5 days, or whenever you're getting up from your computer while your character is at the AH. -on will search through all the listings of the item and organize them by price per. 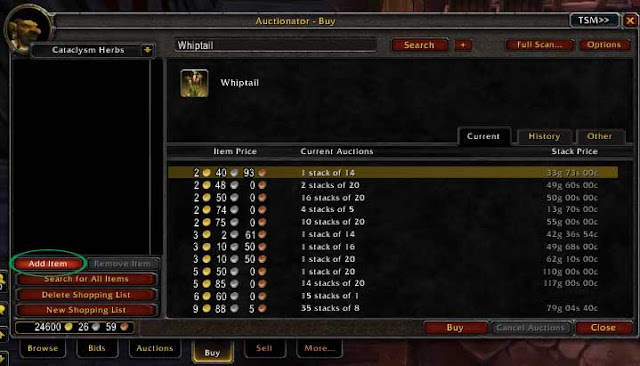 Watch out here because people may be selling something you want 1 or 2 of in stacks of 13 for example, just look under the current auctions column for the stack size. If the seller has more than one stack when you hit the buy button it will allow you to keep hitting the buy button until you buy all their stacks at that price or run out of money. 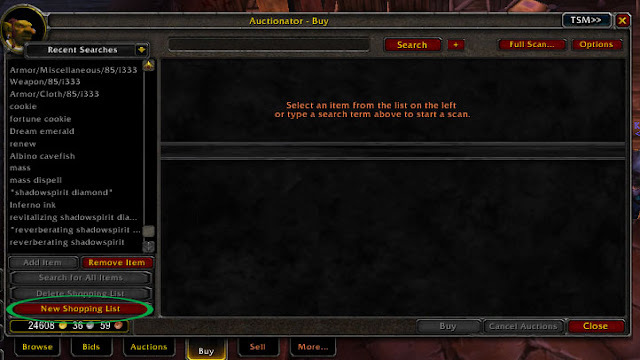 This is one of the HUGE advantages over not using an add-on at all, or even using Auctioneer. 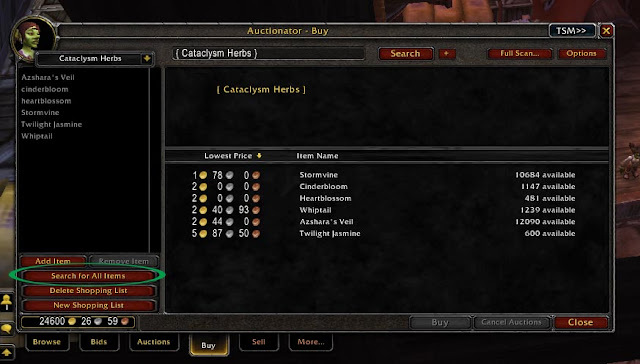 If you want to make a list of things you commonly buy, suppose Cataclysm herbs for example, hit the "New Shopping List" button and type in a name. For me it will be "Cataclysm Herbs". Now choose your new list from the drop down menu on the left, if it isn't already. Next search for an items (such as Whiptail), and once it's done scanning, hit the "Add Item To List" button, and boom, it's now on your shopping list. Continue to do this until you have everything you want on a list. This will allow you to search for all items, just hit the "Search for all Items" button, and you will have a list of each item with the lowest price for each item next to it. To buy a specific item, click on it and you will be brought to the normal interface for that item. From there you can hit the back button and return to your search results. The sell tab in auctionator is really unique in that you drag an item from your bag into the box on screen (it's pretty self explanatory) and the list of all auctions currently for that item come up, and you have the option to undercut the lowest. Batch posts your items with ease. The basic functionality of this tab is to scan your auctions, and cancel any auctions where you're undercut. The main drawback from this function is you may be canceling auctions that are only undercut by one other auction, by 1 copper, where you'd probably sell your goods in the long run anyway. In all, Auctionator is a great posting add-on, but I'd like to note that while writing this piece I did see some posts on curse about people having issues with it, but I personally have not. At first glance, TradeSkillMaster (TSM) is bulky and has what seems like an overwhelming amount of functions. In this post I will focus only on the posting and canceling functions of this add-on, which allow you to batch post a lot of items you commonly post, just by clicking one button. This add-on is really useful if you are posting something like glyphs or gems, and there is a high turnover rate. It allows you to specify how many you want to post at a time and stack size, which I will go over in the post. Before you start, you can't just download TradeSkillMaster, it's a bare bones add-on. TSM has plug-in add-ons that you will also have to DL for certain functions. I use TradeSkillMaster_Auctioning, TradeSkillMaster_Crafting, TradeSkillMaster_Shopping, and TradeSkillMaster_AuctionDB, all of them are available on the Curse Client. For this specific tutorial we are only concerned with the _Auctioning package, but the others are useful, and tutorials can be found fairly easy online, and I will make a post about them some time in the near future. TSM allows you to create multiple lists with common rules (such as undercut price, number you want posted, and stack size). In this example I will be setting up a list for Glyphs. Since you can create multiple lists, make sure that you create lists with things in common. 1) Type /tsm to open the TSM interface. Click the “Auctioning Groups/Auctions” button and then click the “Categories/Groups” on the left, then the tab called “Create Category/Group” to create a new list. Type the list name in the box, my example will be called Glyphs. 2) Now that you created your list, click the list you just made, and it will open to the “Add/Remove Items” tab. 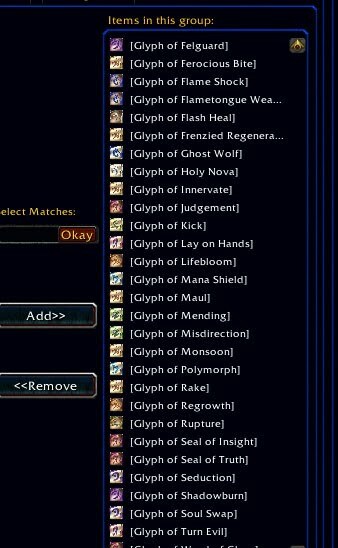 You can type a word in the middle text box to select all items with a similar word in it (like “glyph of”), or select all the items one by one. Then Hit “Add››”. 4) Now click on the “Group Overrides” tab, and you will be able to set up rules for your list. To change an aspect you have to right click the option to unlock it, and then change the numbers. For some things you will want the starting price minimum to be relatively high, and for others you will maybe only want it to be 5g. Go through all the options, and get a feel for what they do, and customize your group (These options only apply to this specific group!). 5) Repeat stems 1-4 (creating multiple groups) until you have all the items you batch post daily, with useful rules. 6) Now it's time to auction! Head to the AH (If you weren't there already) and click the "TSM››" button to open the TSM interface. 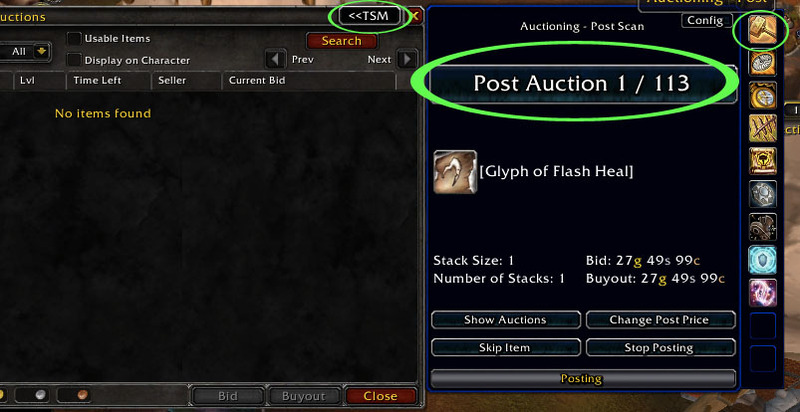 Click the top tab, “Auctioning - Post” and TSM will start scanning all the items on your lists that are in your bags. This is the true beauty of the add-on. Just click the big “Post Auction” button until all your auctions are done posting and walk away :-). After all your lists have been set up, all you have to do is this step to post these items in the future. TSM allows you to batch cancel all your auctions that you have via the lists you made in the above process. Doing this will create a lot of mail, and I suggest the Postal add-on to deal with this. To Cancel all of your undercut auctions, click the tab under the posting tab, “Auctioning – Cancel. It will automatically start the canceling scan. Whenever TSM comes across one of your auctions that is undercut, the same big button from posting will come up, instead saying Cancel Auction. Click it until all your undercut auctions are cancelled, head to the nearest mailbox and repost :-). Simple as that. The initial steps setting up this add-on seem like a hassle, but the payoff is well worth it, and it is a huge timesaver in the long run. Some people want to see what they sold and what they made money from, I personally just want to see the net results, so this add-on is perfect for me. There are some caveats to this add-on though and I will show you some of them right now. So this is the basic layout of the add-on. On the bottom are tabs so you can go through the different tabs on the bottom of the page allowing you to look at data for the week, day, session or total overall. I find the day and week functions to be particularly useful because it lets you cleanly keep track of your revenue and expenses. The week function resets every Tuesday, which I think is great to coordinate with server resets. It also lets you keep track of spending per character, because sometimes you want to just look at your bank alt and not your wasteful main :-P.
Since this is just a basic spreadsheet add-on that keeps track of all the money that goes in and out, there are some flaws to note. If you look at this row, you'll see that I had about 80k g worth of Mail “Expenses”. This clearly will never be the case unless you buy things COD. This is money sent between alts for the most part, and since (presumably) all the mail was recorded, it was also shown as revenue. If you want to find how much you made for the week from selling things at the auction house subtract Mail Expenses from Mail Revenue. In this example it's 117,614 - 80,000 = 37,614, so I made 37,614 in the mail from AH. 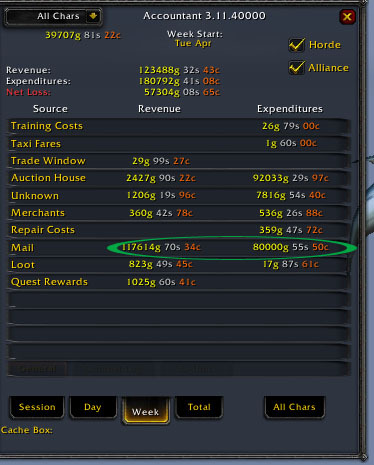 Also from this screenshot you may notice that there is Auction House Revenue. Not really sure what they mean by that, because most of the AH income is accounted for in mail. Like I said not the most accurate or detailed addon, but it gets the job done.